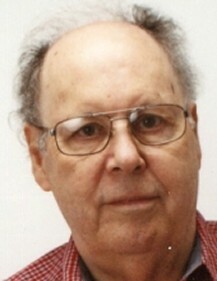 Donald L. “Pat” Irwin, age 86, of Council Bluffs, passed away February 10, 2019 at Jennie Edmundson Hospital. Pat was born September 16, 1932 in Iowa City, Iowa. He graduated from Iowa School for the Deaf in 1951, where he excelled in basketball. Pat proudly served his country in the U.S. Marine Corps during the Korean War. He married Floy Mott on September 22, 1956. They were blessed with four children: Doug, Marsha, Kathy, and Lori. Pat was a printer at the Omaha World-Herald for many years and eventually became a counselor for the deaf students at IWCC for 15 years, retiring in 1995. He played basketball and softball for the CB Silent Club, was past-president of the Iowa Association for the Deaf, past member of Sertoma Club, and an avid fan of the UCONN Women’s basketball team and Dutch violinist Andre’ Rieu. Pat was preceded in death by his mother, Lillian Stoltz; son-in-law, Chuck Jennings; brother, Robert Stoltz; and sister, JoAnn Nelson. He is survived by his wife of 62 years, Floy Irwin; son, Doug (Tami Bolte) Irwin, all of Council Bluffs; daughters, Marsha Irwin, Kathy Jennings both of Kansas City, Missouri, Lori (David) Gleason of Atkins, Iowa; grandchildren, Becky (Jaime) Hernandez, Abbey (Morne') Diedericks, Libby Gleason, Katie Gleason, Kari (Eric) Allen, Nikki Jennings, Daniel Jennings, and Jennifer Jennings, 3 great-grandchildren; brother, Eugene (Martha) Irwin, Jr. of Redfield, Iowa; sister, Marilyn (Leon) Isakson of Charles City, Iowa; many nieces and nephews. Pat’s funeral service was held last Saturday, February 16, 2019 at 11 a.m. at Cutler-O'Neill Meyer-Woodring Funeral Home & Crematory, 545 Willow Avenue, Council Bluffs, IA 51503. After the service, private family burial in Ridgewood Cemetery with military rites tendered y the Kanesville Riders Honor Guard. Thanks to Cutler-O'Neill Meyer-Woodring Funeral Home & Crematory, Council Bluffs, IA and Elizabeth Simmons for the information.